The Amygdala: Work It & Be Panic Free! “Why then would we not want to understand the amygdala’s role in panic attacks and anxiety?” I asked that question twice in yesterday’s piece. And now we’re going to act on it! To recap, the amygdala is a bundle of cells the size of an almond, located about two-inches in and up from each ear. Amongst many other functions, according to neuroscientist Dr. Joseph E. LeDoux, the amygdala orchestrates our response when the Big Bad Wolf is at the door (the wolf bit is mine). Be sure to bone-up a bit on the amygdala. Here’s a link to yesterday’s article. Certainly, memory comes into play when we recall, say, our first love. And there’s a different type of memory that prompts our physical routines, like brushing our teeth. We’re going to focus upon yet another type of memory – recall from previous experiences. This is known as emotional memory. Emotional memory is unique, to say the least. Now, it was originally thought that emotional memory was managed solely by the amygdala; but, along came University of California, Irvine neurobiologist Dr. James McGaugh. McGaugh suggests the cerebral cortex (cortex) plays a major role in emotional memory. But, it needs a dance partner – a working amygdala. 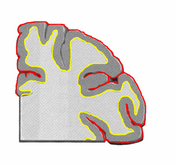 FYI – the cortex (a slice just above) is the 1/10 of an inch convoluted external surface of the brain. It’s commonly referred to as grey matter. It’s about so many things; including thought, memory, language, attention, awareness, and consciousness. As a side note, here’s something amazing. Neuroscientist Dr. Rodolfo Llinas discovered that the cortex emits a 40 hertz (cycles per second) electrical signal, which presents in the form of an oscillation – a hum. The waves are known as gamma band, and cease during sleep and unconsciousness. So the questions becomes, is consciousness itself reflected in this 40 Hz hum? Is that cool, or what? According to McGaugh, fear can’t be learned in the amygdala. In fact, here’s its true role. The amygdala communicates with the storage cells of the cortex and tells them to prioritize a piece of memory. This is a process of selectivity driven by the amygdala. Okay, so the amygdala is the driver, not the thinker. How can we take the wheel? As if I had to tell you, though it can certainly be done, emotional memories are tough to alter. And that’s because there are all sorts of neural pathways traveling from the amygdala to the cortex, but the highways heading back are a bit scarce. Think about it – if we were cavemen and women, with sabre-toothed tigers all around, that would be great. But, as modern day folks enduring panic attacks and anxiety, these ancient design dynamics present problems. According to our buddy, Dr. LeDoux, influencing emotional memories isn’t about erasing them. Rather, it’s a matter of training the amygdala to react differently when walks down emotional-memory lane occur. Here – let’s say a gaping hole opened in your family room a month ago. You’ve learned to walk around it for the past 30 days because, obviously, you don’t want to take the human elevator to the basement. Your avoidance behavior is based in chosen action – walking around the hole. But to have accomplished this, the “fear of falling into the basement signal” within the amygdala had to be rerouted to direct it toward areas of the cortex responsible for active behavior. The amygdala had to tell the cortex to lower the falling bit on the priority list. As a result, the amygdala now associates the hole in the floor with action, as opposed to freezing and avoidance – as it likely did when the hole first appeared. And each and every time this action prevents disaster, the rerouting within the amygdala becomes all the more ingrained. The amygdala has been trained! This is how we work directly with the amygdala in changing our response (action) to real or perceived threats. It’s a matter of working smart. Remember, the amygdala is the driver, not the thinker. I understand it may take time to grasp what we’ve learned and put it into action and practice. But you’ll be amazed at how just knowing these mechanics can totally turn our fear responses around – and put the kabosh on our panic attacks and anxiety. When chipur readers ask me how I whipped panic and anxiety, believing in – and practicing – what you just read is the guts of my reply! Previous Post: The Amygdala: Destroy Panic & Anxiety!